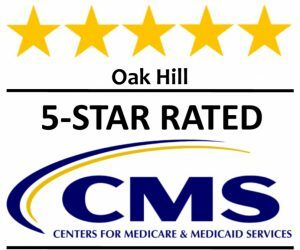 At Oak Hill, there is nothing more important to us than the care of our residents, but we are not your ordinary nursing home. Our residents are not just patients to be attended to, nor are they simply names on a list. At Oak Hill our residents are family, and it is our mission to seek their care beyond the basic needs required. It is not enough that our residents simply get by, we want them to thrive and flourish. In fact, this has been our mission for over 60 years. Since 1951 we have been providing professional nursing home care to the residents of Monroe County. We want to make sure that the sense of community our residents have felt in Waterloo and the surrounding towns continues as they enter Oak Hill. The truth is, for us, that mission would be hard to forget because our residents are the loved ones of our friends, neighbors, and families. We believe we have a responsibility to the community to provide a home away from home, a place where residents can enjoy and look forward to their time. To achieve this mission, we have worked hard to ensure we offer the best in on-site services. Evergreen Pointe is our Rehabilitation Center, which is our short-term rehabilitation facility for those in need of post-hospital rehabilitation. Our state-of-the-art facility has been designed to not only meet physical needs but to encourage mental peace and health, ensuring a smooth transition from hospital to home. Arbor Court is our Skilled Care facility, which provides 24-hour care and support for seniors who need a personalized, long-term care option. Our interdisciplinary care team works to provide comfort and intentional, meaningful care for our residents. Magnolia Terrace is our Senior Living Apartments. These one-bedroom apartments are affordable and private, while also providing 24-hour access to staff. Additionally, we work with both residents and families to guarantee customized and specific accommodations for our residents’ preferences and lifestyles. Whispering Pines is our Memory Care unit, which offers personalized treatments for those dealing with dementia or Alzheimer’s. This secure memory care facility works to enable and empower residents in a comfortable, safe environment, allowing them to focus on their strengths and be an active participant in their daily care.